Much has been made of the fact that currently available energy sources are polluting and finite. Furthermore, much has been made of the belief that renewable energy resources collectively hold the potential to meet the energy demands of the world. Therefore, reason will dictate that the development of renewable energy resources is a positive direction that will first reduce then eliminate the need for carbon-based fossil fuels. This trend has seen a considerable push in the harnessing of power, with one example being from sunlight (to name just one from the numerous natural energy resources). Solar energy, through the sheer volume of sunlight received each day, comfortably exceeds the amount needed to generate electricity to meet the demands of our energy-intensive societies. Thus, the deployment of solar energy technology to harness this unrivalled energy source is both required and sensible. Through the years, solar energy technology has been developed and advanced with the aim of capturing as much solar insolation as possible and converting this captured energy into useful electricity. While the progress made has allowed for some improvement in reducing the level of dependence on non-renewable energy sources, there are three issues that block the full and widespread utilization of solar energy technology. One of the three issues concerns the carbon footprint of the industry. Every single step made, and every single action taken, affects our carbon footprint. This footprint is a reminder of the collective greenhouse gas emissions made whenever something is built or transported or consumed. Renewable energy technologies are a mixed bag when discussing carbon footprints: even though the technology may be renewable, the technology is not necessarily low-carbon intensive. This is just one of the issues, the life cycle carbon emissions of the various renewable energy technology. The other two issues - particularly for solar energy technology but applicable to other renewable energy technologies - can be divided into manufacturing and technical. The manufacturing issue focuses on the cost of producing solar cells and modules to form a solar array, ready for use for residential or commercial applications. The cost of extracting silicon, the main component of a solar cell, is significant. In addition, the multi-part manufacturing process is complicated, time-consuming, and devours a lot of energy. The technical issue affecting solar energy technology is the electrical energy efficiency conversion rate. The efficiency rate offers an understanding on how effective a solar cell or module will be when converting sunlight into usable electricity. The efficiency rate for a typical silicon-based first generation solar cell is around 22 %. Second-generation solar technologies possess efficiency rates ranging from 11 % to 19 %. Even though the solar energy technology movement is burdened with these issues, progress has been made recently in reducing the associated costs of producing a photovoltaic cell. And indirectly, reducing the cost of manufacturing will also assist in reducing the carbon footprint. Solar cells are required to be durable, possessive of a high mechanical strength, and have the ability to survive extreme weather conditions (known as ‘weatherability’). In order to achieve this, the solar cell needs to be encased in material or treated in such a way as to be toughened to meet these conditions. These materials and treatments are generally harsh to the environment and involve the use of toxic chemicals. Currently, a variety of the plastic components in a solar cell are based on petroleum. Petroleum-based products are not environmentally friendly, which runs against the whole concept of utilizing green technology. By incorporating bio-plastics into the solar cell make-up, this unfortunate illogicality can be rectified. In the past, bio-plastics were considered unsuitable for use in solar photovoltaic cells for a range of reasons; chief among them are the low melting temperatures and the very delicate nature of their molecular structure. Such features make bio-plastics unacceptable for use as they would not even make it through the manufacturing process, let alone for application in places that receive a significant amount of insolation such as a desert environment. Recent developments have led to the possibility that the bio-plastics may be able to overcome these limitations and find application in solar energy technology. BioSolar, a company based in California (USA), has produced a variety of solar cell components made from bio-based material. This novel technology incorporates renewable sources as a feedstock to produce bio-plastic solar cell components with the ability to handle the manufacturing process. Using a mix of cotton and castor bean derived Nylon 11, the non-food and plant-based constituents produce solar cell backsheets and are expected to produce solar cell superstrate (for crystalline and thin film solar cells) and substrate layers (for thin film solar cells). These layers will be suitable for the injection molding process and even roll-to-roll printing steps found in the manufacturing process. This will ensure that this technology is suitable for both crystalline and thin film solar cell manufacture. 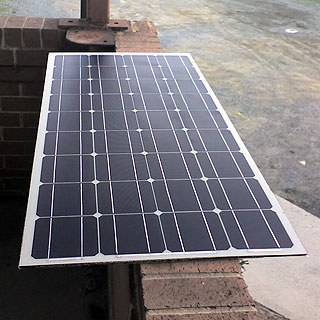 In conventional crystalline solar cells, the backsheet is a petroleum-based cover that protects the solar module from the natural elements in the environment it operates in. BioSolar, with its proprietary and novel technology of mixing cotton with Nylon-11 to form a cellulosic material that is mechanically robust and durable while still retaining electrical properties, has produced an environmentally friendly backsheet that can withstand the demanding manufacturing process. Figure 1 shows the backsheet component in a typical crystalline solar cell, and Figure 2 is a photograph of a complete solar module with the white backsheet. The environmentally friendly nature of the backsheet was taken one step further by BioSolar’s redesign of the solar cell backsheet. Traditionally, the backsheet is made up of three components: a top layer of Tedlar®, a middle layer of polyester, and a bottom layer of either Tedlar® or ethylene vinyl acetate (EVA). By replacing three layers with a single layer, BioSolar has reduced the cost associated with the solar cell backsheet by 25 %. With confirmation from the National Renewable Energy Laboratory (NREL) confirming that the BioSolar solar cells operate just as long or longer than conventional cells, this 25 % reduction in the cost of the backsheet makes the technology quite promising. Not every component in a solar cell is suitable for replacement with a bio-plastic equivalent. However, certain components found in crystalline solar cells and thin film solar cells are appropriate, and BioSolar aims to produce these eco-friendly replacements to further reduce the cost of the solar cell as well as the environmental impact. Thin film solar cells are experiencing a boom due to their flexible nature and lower costs. Even so, BioSolar are producing bio-plastic components to further reduce the cost of manufacturing thin film solar cells. A component analysis of thin film solar cells indicates the substrate layer suitable for replacement with an environmentally friendly version. 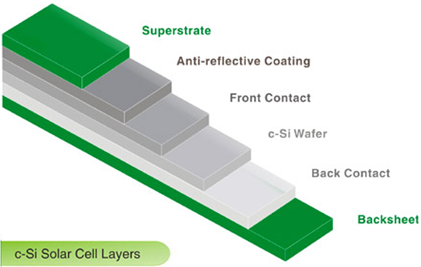 Thin film solar cells currently utilize a layered approach, where the substrate acts as a base on which the other layers (such as the transparent conductive oxide layer) are put down. Accordingly, the properties of each layer play a part in making the thin film solar cell operate electrically and in making the solar cell mechanically tough. By altering the mix of cotton and Nylon-11, BioSolar aims to produce a thin film substrate able to provide mechanical strength as well as providing the same level of electrical conductivity. 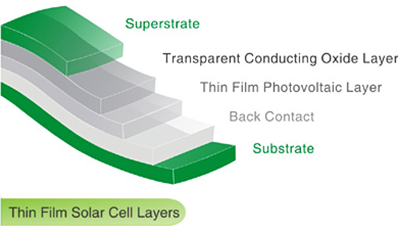 Figure 3 shows a thin film component breakdown with an indication of the layers suitable for bio-plastic replacement. The top layer of a crystalline solar cell not only acts as a top cover for the solar cell but also indirectly determines the solar cells’ efficiency. Conventionally, the top layer is a glass layer or some polymeric composition, allowing for light to enter the solar cell and kick-start the electron ejection process that ultimately is converted into usable electricity. Whether glass or a polymer layer, these tops cover for a solar cell are expensive and bring up a weight issue. This layer requires an adhesive to stick to the rest of the solar cell as well as an anti-reflective coating to minimize heat loss. BioSolar’s aim to is replace this superstrate layer with a bio-plastic version to reduce manufacturing costs further and to be kinder to the environment. By altering the castor bean-derived mixture, BioSolar believe a transparent superstrate layer will be produced that will allow for maximum absorption and the minimum use of harsh chemicals in a solar cell. While solar energy has the greatest potential to transform the way society generates electricity, doing so in way as to harm the environment reduces the impact of generating power from natural resources. If ways or techniques could be developed to reduce this impact while generating clean electricity, then a clean energy future is well within grasp. BioSolar has utilized Nature to produce solar cell components that are kind to the environment. These products will be attractive to the solar cell manufacturing industry (due to their low-cost manufacturing process and reduced use of harmful chemicals). BioSolar may have just created this path to a cleaner and greener future for the solar energy industry.